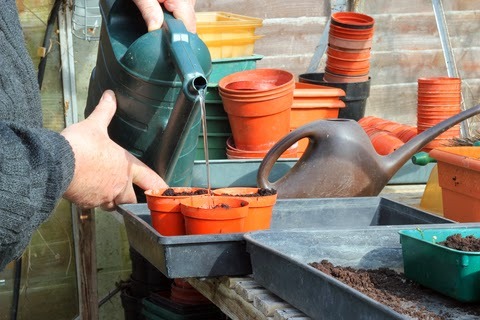 If you feel like doing a bit of sowing you can start some broad beans in pots in a cold frame or unheated greenhouse and indoors there’s scope for sowing seeds and growing lettuce, spinach, salad onions and brassicas. If you have a heated propagator, even better. Outside again, if the ground is wet but you really need to get on with the digging then laying a plank of wood to walk on will save compacting the soil. Covering prepared seed beds with horticultural fleece or clear polythene helps warm up the soil before any sowing. Bare rooted fruit trees and bushes can be planted if the soil isn’t frozen. In late January it’s time for forcing rhubarb and seakale outdoors. In the greenhouse sow French beans for forcing, leeks, and even early crop tomatoes. In mid January sow seeds for small salads under glass in a slightly heated greenhouse or heated frame. Grow mustard and cress, lettuces and radishes. Plant potatoes in frames and pots in John Innes potting compost No.2. Keep egg boxes for chitting potatoes.